Once you have decided to go for a thin client, you still have to choose which one. We look at five different devices from the wide variety of thin clients on offer. There is no such thing as the best thin client. Nevertheless, in this article I compare five representative models – why? Because the thin client certainly is the best device for a particular purpose. The intended application determines how practical and inexpensive a certain thin client is. If the application only uses text-based menus and ASCII art, if you do not need to connect to local peripherals, and if response time is not critical, your needs will certainly be well served with an inexpensive entry-level model. However, if you want to work with multiple monitors or even handle multimedia content to a significant extent, the entry-level choice is not optimal. Additionally, if you need special interfaces, you will have to look for a thin client that is equipped with them. The choice is quite varied. We picked five fairly universal models, including entry-level devices and their better-equipped competitors (see Table 1). The small device by Dell Wyse costs about US$ 335 and thus costs less than any other device in this test; however, this entry-level device does not fare well in feature comparison with the better-equipped candidates. However, the 500-gram lightweight unit can be mounted easily on the back of the monitor and can be retrofitted with WiFi. Our test unit had a conventional Gigabit LAN port, a DVB-I port, and four USB 2.0 ports, as well as audio in and out. That's not overly generous, but it is adequate for many purposes. Additionally, this frugality benefits power consumption, which is amazingly low at about 7 watts in normal operation. The Thin OS graphical user interface seems a bit spartan (Figure 1) and does not offer many options, but it's functional and easy to use. The supported session protocols are ICA or RDP but include nothing more exotic and no browser. Figure 1: The Thin OS graphical interface seems a bit spartan. Interaction with a Citrix XenServer or VMware View Connection Broker is possible, and the thin client also supports the Quest Software or Leostream VDI brokers and Windows Terminal Server. Even the small Wyse T10 client can be managed using the Wyse Device Manager (WDM), which can handle thousands of thin clients from a central location. 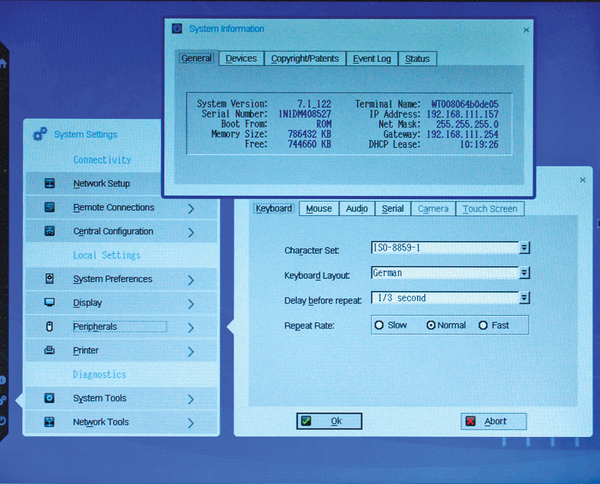 The interface of the IGEL, Linux version, is divided into the Setup and Application Launcher sections and offers well-structured menus with a wealth of options (Figure 2). They include the obligatory ICA and RDP protocols, as well as support for the Horizon and vWorkspace clients for Leostream and the NX and 2X clients and SAP sessions for the PowerTerm and IBM iSeries terminals. 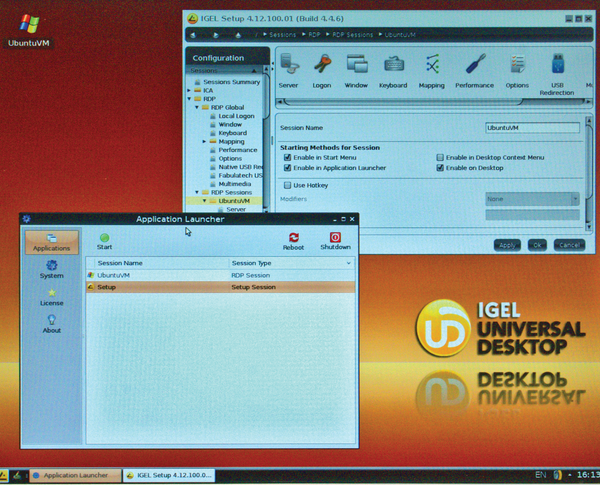 Figure 2: An elegant Linux interface: the IGEL client. Java Web Services or the Linux ThinLinc remote desktop server also can be supported. A built-in browser is provided, of course, along with a VoIP client that transforms the thin client into a phone. IGEL Linux also provides detailed hardware information and configuration options for locally attached peripherals, such as storage or printers with tools similar to those found in the desktop environments of popular distributions. Diagnostic tools are available for troubleshooting network problems. On the hardware side, the device from IGEL impresses with an integrated smart card reader that allows any user to log in securely, quickly, and conveniently via two-factor authentication. In addition to a DVI-I port, the current model also has a purely digital DVI-D port, so you can run two monitors at the same time in a dual-view configuration. An optional special foot contains a serial interface and can accommodate wireless technology. Most thin client vendors provide centralized management tools with which large numbers of their clients can be updated and configured centrally. In the case of IGEL, this tool is called the Universal Management Suite, and you can use the suite to manage this versatile device, too. Like the IGEL, the Rangee comes with two DVI ports and is thus particularly recommended for workplaces where you want to work with two monitors. The model we tested did not have a card reader, unlike the IGEL, but the fairly wide Rangee product portfolio also includes devices with smartcard readers. The rest of the hardware equipment is largely consistent with the common denominator in our test: four externally accessible USB ports, Gigabit network, audio in and out, one PS/2 for keyboard or mouse. A special feature of the Rangee is a fifth USB port inside the box when you remove the top cover. You can connect a WLAN stick here. The Rangee's GUI (Figure 3) feels somewhat minimalist, but it is straightforward and lends itself to intuitive operation. Just as with the hardware, it is also important in terms of Rangee's software features that you buy the right product for your needs: Although you can find an answer to almost every need, you will find no all-arounders; instead, the options are distributed across multiple specialized devices. 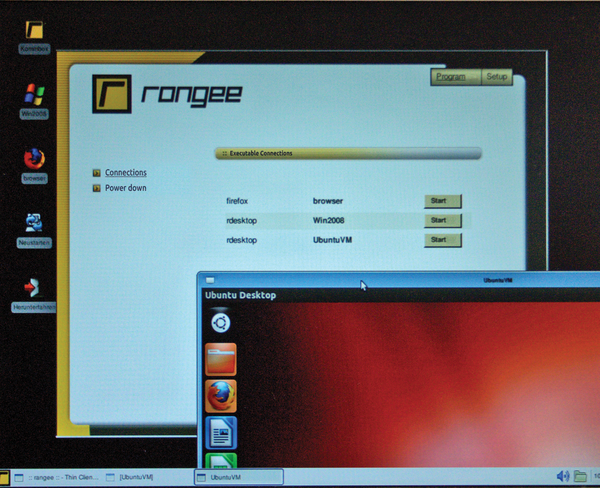 Figure 3: Rather simple appearance but functional: The Linux interface of the Rangee S-L700. Rangee's management solution goes by the name of Thin Client Management Server (TCMS), and it successfully managed the device we tested. TCMS itself can be installed on a thin client or on a virtual machine and works over WAN if needed.